The first showing of the spring play performance. 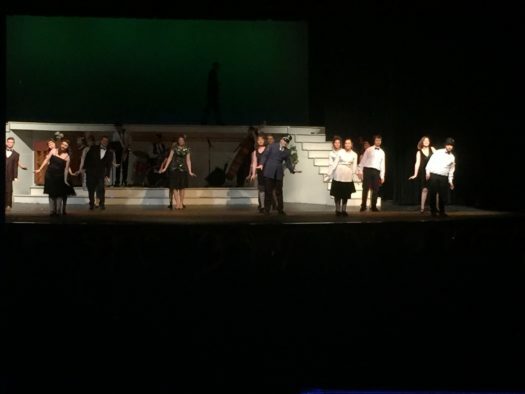 Shawano Community High School presented The Great Gatsby on April 4, 5 and 6 in the auditorium. The production went off without a hitch, and the performance times were at 7 pm for April 4 and 5 and 2 pm on April 6. The drama is about a man that falls in love with a woman. The guy leaves, and the girl ends up marrying someone else. The twist is the guy comes back to find out the love of his life is remarried. 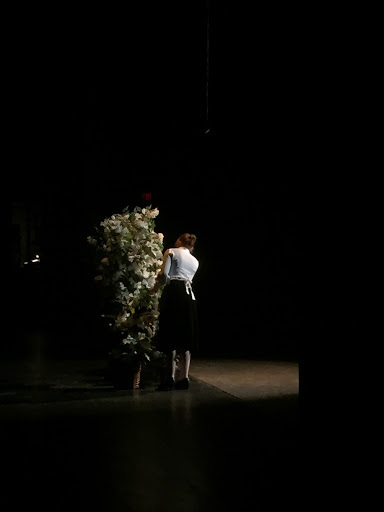 Sophomore Jillian Black plays an important character named Myrtle Willson. Myrtle is the girlfriend of the main character, Nick’s, best friend. Black has been involved in DI, the tech crew and in the pit for plays and musicals before. She got involved in this play because she was always giving the other actors advice, and they inspired her to try it herself. “I was nervous about missing a cue, but overall I think we were prepared really well. Our set was all done, whereas last fall we were still painting opening night. I love the different aspects of this play especially the scene where my character gets hit by a car. Not only that, but the live band on stage is really awesome,” stated Black. In late February the crew began practicing after school from 3:45 to 5:30, and for the final weeks of preparation they moved rehearsals back to 6. Black is happy with her role and is glad she earned the part. Junior Emma Jones is the technical director for the play and is in charge of all the tech. “This is my first time being a tech director, but I have been a tech since the musical of my freshman year. When I started I didn’t want to be a tech, but my brother was in the pit, and I was oftentimes waiting after school for him to get done. One day their camera person never showed up so Mr. Konen asked me to do camera, and to this day I still love it,” said Jones. Black first got into the high school production when she was figuring out what 0.5 credit class to take entering her freshman year, and she decided theater tech would be a fun class. Black mentioned she also looks up to Emma Etten because she has good facial expressions, body motions, can memorize her lines and can play any character. “My character is one of the more important roles, but it’s not the most important. That’s why I like this play because there are so many crucial roles. The hardest part of preparing was that my character is supposed to be very scandalous which is the hardest thing for me to replicate and prepare myself for,” explained Black. The music is modern with a jazz style, and Hunter Krolow rewrote it, so it fits the 1920s scene. That is what made this production so unique. Both girls will be continuing their theater experiences and could not imagine doing anything else. An actress backstage. Photograph courtesy of Emma Jones.